Partner Nicholas V. Chen received the 2012 Trailblazer Award last Friday during the 24th annual convention in Washington, D.C. 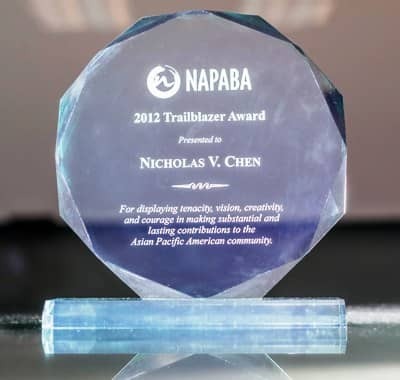 The Trailblazer Award, which is NAPABA’s highest honor, recognizes individuals who have “demonstrated vision, courage, and tenacity, and who have made substantial and lasting contributions to the Asian Pacific American (APA) legal profession, as well as the broader APA community”. As part of its annual convention, NAPABA honors a member from each region who meets these criteria. The honorees are selected by the regional governors and the affiliates in their region.